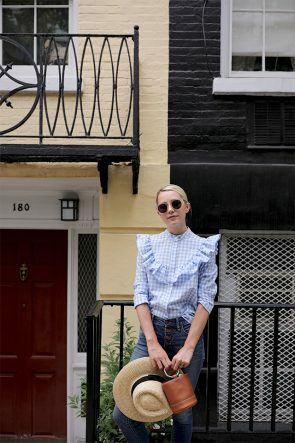 Top: ASOS (see all my other gingham finds here). Denim: Madewell (current favorites). Bag: Simon Miller. Hat: Brixton. 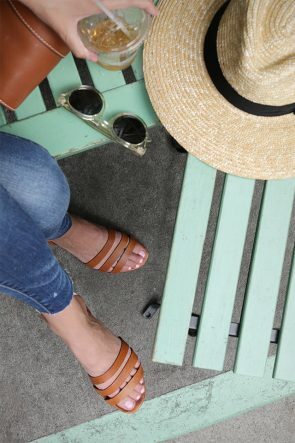 Sandals: Madwell. That top is so fun! Gingham is just perfect for the summer. Simple, trendy and super cute outfit! 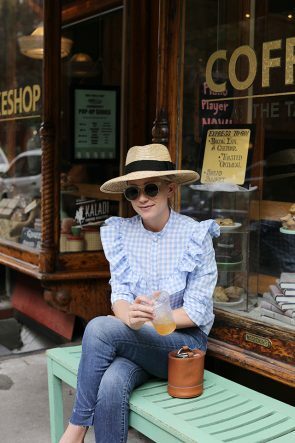 Love your ruffled blouse! Just in love with this blouse. Love the print! Love the perfect look with the frills! Loving this weekend vibes outfit with the cute frills dresser down with your jeans! This is a classic look to replicate. Thanks for the inspiration. Nice outfit! I love the shirt! Wow you look gorgeous, I love this shirt a lot! Love the frilly gingham top! How adorable is that top! Love this outfit! Such a cute weekend outfit! 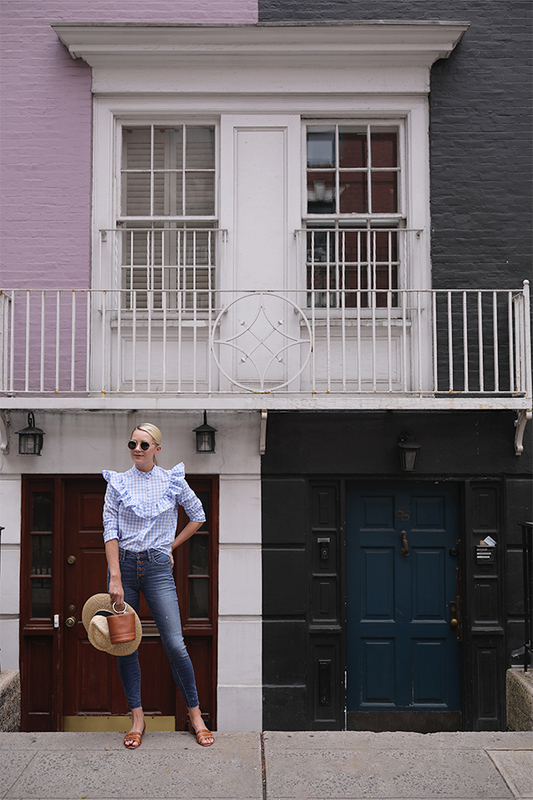 The frilled button-up shirt is a gorgeous feminine style to flaunt, and mixed with denim provides for a comfortable and effortless weekend style. Your choice of delicate jewellery (the ring) is a nice addition – keeping it looking polished. Thanks for sharing! Gingham is such a lovely SS17 trend alongside the stripes, ruffles, mules and wicker bags! I love the bag and the sandals–and they’re so affordable! So gorgeous as always, lady! Definitely one of the prettiest streets in the Village – love! I love ❤️ this top , it looks so cute . Gingham is now a true summer classic . I wish I had the confidence to carry off frills!! This is such a great summer outfit! 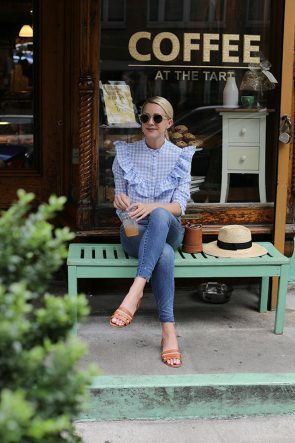 That gingham top is so cute, and I had been eyeing those Madewell sandals for a while! Oh this top is SO fun! Love the outfit! Such a cute and casual summer outfit! And btw. I’m so in love with the blouse, it’s so lovely! Ok I absolutely LOVE this hat. Cheaper option than your Gucci Trilby , which I ended up buying for my trip to Cuba this summer. That gingham shirt is everything. I love this top and shirt!! You look awesome! Amazing style! Love the blouse so much! Perfect for an everyday style. This top is so pretty, I love the ruffles! 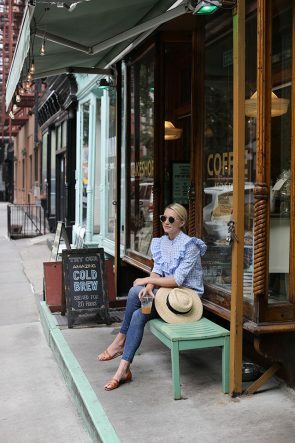 It kind of blouse is the must have of this summer! It’s a very nice and pretty casual look. Love love love your outfit! Who makes your sunglasses? And did you order the top in your normal size? Cutest weekend casual look! Loving the top and bag.